Those who follow my blog have probably observed my love of baked oatmeal. I have created a dozen or more seasonal versions of this hearty, make-ahead breakfast. (You can scroll through the Breakfast Foods category to see all the options.) 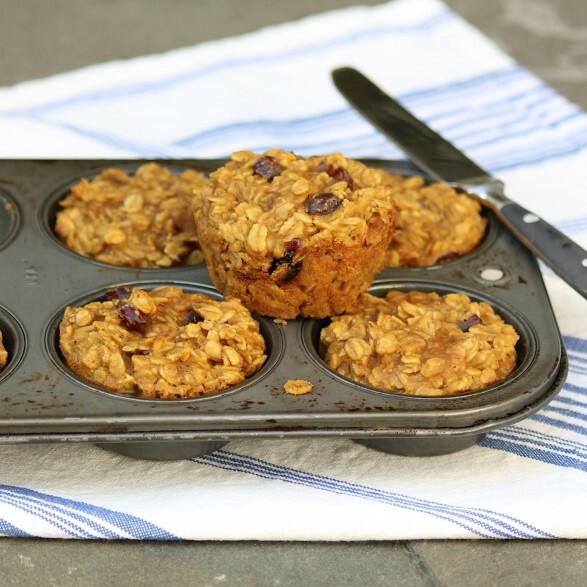 The following portion-controlled muffin recipe is a super-quick version that my kids love as a speedy breakfast or a healthy snack. I make it at least once a week. The batter mixes up in minutes and is perfect when you have an overripe banana on hand. For a special treat, I occasionally substitute chocolate chips for the dried cranberries. Raisins work, too. Though peanut butter may be used in place of the almond butter, my kids actually prefer the almond butter in this recipe for its more neutral taste. If you use peanut butter, I recommend the natural variety. 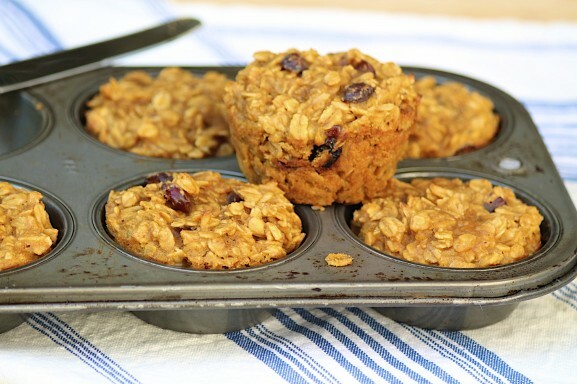 These muffins may be baked in advance and are a welcome quick breakfast or healthy snack. They are also ideal for those needing a vegan, eggless, gluten-free, or dairy-free option. I love the combination of banana and pumpkin but have also made these with all banana. The important part is using one cup total, even if you use more of one fruit than the other. Preheat the oven to 350 degrees F and grease or line six muffin tins. Mash the banana, the pumpkin, and the almond butter together in a large mixing bowl. Add the dried cranberries, milk, maple syrup, and salt. Stir to thoroughly combine. Stir in the oats and mix to incorporate. Bake for 20 minutes or until the muffins are firm on the top and just cooked through the center. Cool in the pan for 5 minutes and then remove. Enjoy right away or allow to cool completely. Cover and store any leftovers muffins in the refrigerator. The above recipe is my super-quick recipe and the one I usually make. If you would like to tweak the flavors a bit, you may add 1 teaspoon of cinnamon or pumpkin pie spice, a teaspoon of vanilla extract, or use chocolate chips instead of the dried cranberries. This is why some of my family’s favorite recipes take a while to get posted. They get eaten before I take the pictures! This recipe can be seen on Lamberts Live Create It Thursday and Moonlight & Mason Jars. Hello I would love to make these muffins tomorrow but do not have almond butter, if I use butter would that change the recipe? Great question, Sara. If you make a substitution, use peanut butter. Different than regular butter, almond butter is to almonds what peanut butter is to peanuts. Regular butter would not work in this recipe. Coincidently, I just made a batch using peanut butter today! Too funny…I just typed a reply to the previous commenter who dislikes bananas. You can read that comment above, but I would recommend all pumpkin and, secondarily, a mix of pumpkin and applesauce. I haven’t tried it this way–of course, I have made them with all banana!–but am pretty sure you will be happy. I’d love to hear how you make out! So glad to have found your blog. I’m visiting from Create It Thursday and when I saw that link I just had to come see more! These muffins look fantastic. I’m not a baker but I’ll definitely give these a try. Love the combination of flavours! Thank you, Robyn! I am glad you found your way over and said hello! Hi, can you tell me the approximate calorie content per muffin? Thank You Ann. I have not calculated calorie values but many people have reported liking online apps such as caloriecount.about.com and myfitnesspal.com. I hope that helps! I made these muffins twice already–delicious and they are so much healthier than most. So easy, too! I am thrilled you made and enjoyed them, Lisa! Hi Ann! After weeks of the newspaper version of this recipe sitting on my kitchen table, I finally made these and our family extends to you a unanimous BRAVO! These muffins hit the trinity of criteria: healthy, delicious, and easy. Thank you! And what a great photo of Christian…. but tell me — why do the best eyelashes end up on boys? I made these yummy muffins with the chocolate chips while I was waiting for your new granola bar recipe after seeing it on Facebook. Fantastic recipe! Can you use instant oatmeal? I have not used instant or quick oats with this particular recipe. The texture would likely be a bit mushy, so I do recommend the type that cook in five minutes. If you do happen to try with instant oats, please report back…and perhaps add some nuts for a little extra texture. 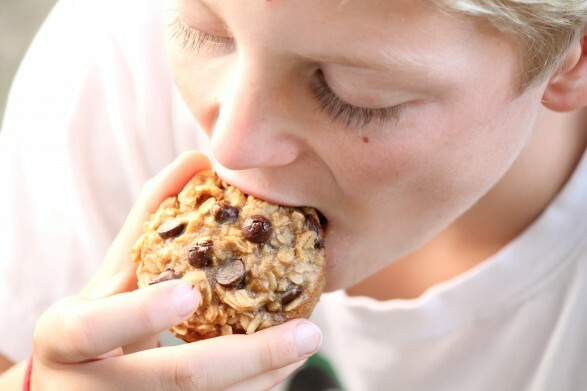 So good those oatmeal muffins! THanks for the recipe! Absolutely, Dino. You could also stir in some shredded coconut if you like. Ann, any estimate of calories per muffin? My two college boys eat healthy. I will make this regardless because it is so healthy. Hi Ron, I haven’t calculated the calories for these muffins, but if you like, you can use this nutritional calculator and easily adjust for any substitutions: https://www.caloriecount.com/cc/recipe_analysis.php. It’s the best that I’ve found and very user friendly. As for swapping out the pumpkin with additional banana, I think that will work quite well. And just in case you’re a sweet potato fan, you could use sweet potato puree–or even apple butter–as well. Hope this helps! I spent some time digging into your recipe archives recently and am so glad I did! I’ve been making these for my family for the past two weeks and everyone loves them and stays full until lunchtime. Next up is chicken tortilla soup! Great news, Meghan! I’m thrilled these have been a hit with your family and hope everyone enjoys the soup as well!